Good ranking is the key to the success of any Organisation. If we consider Amazon, people only buy the product through search marketing. The most obvious application on Voice Search in Amazon is Amazon Echo or Google Home. Voice controlled Search plays incredibly important role in Web search and Amazon Alexa SEO. The most popular and best products from Amazon are voice assistance devices. Have you ever asked Siri to search for a product on the search engine? Did you ask Siri to show nearby Restaurants? That means voice search has become more popular and doing Alexa for Voice controlled products. 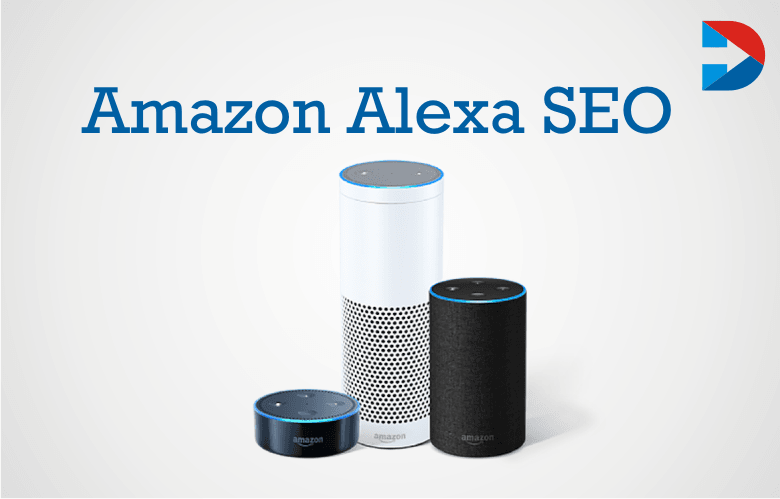 The team Amazon Alexa SEO refers to the optimisation of the products on Amazon platform with improved voice commanded Alexa search. The primary goal of the Alexa SEO is the products are being easily identified or found with Voice search of Amazon digital language assistance. Nowadays more household products are equipped with voice search controllers. As per the statistics, 40% of adults are using voice search once per day. In the field of Search engine optimisation, the voice search has become the big deal for marketers. People use voice to search for to get the quick result. With the help of Alexa Voice search Amazon provides some offers to its customer’s various function through voice control. The Amazon language assistance upgraded with a new small app called “Skills.” Through the Skills app, users can allow getting data using different functions. Skills can handle just a type of a request. The different functionalities possible by skills app are Interactive Games, Order Online food, look up for web information. When you use as cloud-enabled google Home assistance like close the door, switch on/off the lights, change the temperature of the light, Play a movie, change the channel, Video skills, digital smart home skills and some other custom skills. Amazon Echo comes with the speakers tuning it as a mini stereo system. You can play music through Amazon music system through voice control, and you can grab music or radio programs from Spotify or TuneIn. You can also podcast, play songs, record songs from the YouTube. Users of Amazon Alexa can directly do shopping and buy products through voice assistant or a voice-controlled device. The prerequisites of the products can do as Amazon Choice badge. The Amazon choice badge awarded to the individual sellers, and it allows Amazon sell products through Amazon Echo via amazon Echo AI or Alexa. Many people Type as they speak but is not entirely match to the Web Search. So websites are optimised for the way people search. But when it comes to the Voice search more and more people use it to find quick results on online. Based on Voice search we should optimise the websites and things what people used to speak. Current generation uses Voice search because Speaking is more convenient than the typing. People are their smartphones, tablets or voices assistance devices, PC’s to find information online. If you are a PC user, you might have using Microsoft Cortana for Voice search. iPhone or iPad users turn to Siri for voice search and those who use Home appliance for voice search using Google Home, Amazon Alexa, Amazon Echo devices. Voice controlled devices allows users to use from anywhere in Home like if you are using a smartphone, are in a living room or at the computer. As a result proved that 1,000 voice search found that voice answers from the 87% of the featured Snippets at the time. One way to increase the voice search focus on the featured snippet positions. Google found that 70% of Voice search from Voice assistance are conversational that means one person ask questions to the other person. Text searches are more conversational than the voices searches. Voice search is little tricky where a person asks or type text on the search box. Voice searches also should be designs according to the Users tone. 205 of the mobile device searches are from Voice search and number rising by sequentially. Design of the website according to the voice search it steeps at least designing the sites mobile friendly or responsive. Not only for search the visibility of the site to get the top position through voice search is also tricky. Otherwise, your site goes beyond the top view. The Website designers should follow the tips for those who are using Mobiles, use size as 14 and buttons on the site, use responsive designs and Optimize the page loading time is a most critical factor. Many people use voice to search for a searching product on online, nearby locations, Navigation, local search perspectives. The Website developers should design your Site what people often used for voice search. You should Optimise and use the terms at least your site should identify neighbourhood and city. Amazon Alexa follows the below basic rules for search engine optimization making web content on the search engine. Must support the Amazon SEO friendly features for Voice search. Once the product placed under the Amazon Prime that product should deliver within two business days. Otherwise, it is not preferred to order a product through Amazon Echo. The product which fulfills the Amazon prime requirement that would make eligible to request through Amazon Echo. Keywords for Amazon Seo plays a vital role similarly like in Google my business. The keywords should assign based on the voice search. The more accurate of the keywords, the more precise the search, it plays essential role n search. Appropriate product title and description are important for Amazon. Images do not result in voice search, but those products which Organised for Amazon choice Badge will increase the chance of purchase products. Amazon choice badge is markup to the product which fulfills the specific criteria. That means the product should frequently be ordered via Amazon and listed under the Amazon Prime tag. Whenever categorizing the product that product should categorize under correct Filters.The structured data will assist the product search easy and to show quickly on the search engine. The products can deliver faster way. How fast your delivery reaches the people as fast as it is beneficial to the Amazon to buy more products. The product description should appropriately list that could list with highlights of the product and benefits with a detailed description. The content on the description must process by the Algorithm of Amazon Voice Search. With specially designed featured listing the products will increase the products more. If you sell more products, your product listed on top for voice search. How higher the product purchase repeats, that product is included in the Amazon Choice. The inventory term Amazon’s ‘Choice Badge’ is the significant word on which the SEO performance of the products will completely rely. Simply it is the tool that filters fine quality products and delivers at the customers of the Amazon’s official site. When the sellers get permission to place the items in the Amazon Prime that are available to buyers, then the sellers must overview the complete trading strategy. If the number of buyers makes many orders of that then would be counted by the choice badge that allows the Alexa to recommend at the users of Alexa as a default product. If there are no more orders, then it will not be focused by the Alexa and will attain no Alexa’s SEO rank to be the first. It also considers the brand’s shipping guidelines and timings of the production. The conversion rate shows a huge effect on the growth of Alexa’s SEO as the organic search of brand’s products on Amazon will have the higher conversion rate then it is easily recommendable by the Alexa for the customers. Direct the customers to Amazon attained through the promotions on social media sites after committing to purchase the product and it can easily obtain the attention of the Amazon’s Alexa. When the customers reorder the product from the particular brand, then it counts to be in the recommendation list of Amazon’s Alexa as it is responsible for driving the traffic to the landing page of the Amazon. The price of the product that offered to the customers is the major aspect to gain huge traffic in the Amazon e-commerce site that helps to tagged by the Alexa. Always offer the customer affordable price tag that clutches the attention of all consumers. It also improves the conversion rate which gains higher Amazon’s Alexa SEO ranking. The establishment of product ads on social media through the launch of personal landing page that will help to drive huge traffic that makes higher conversion rate on Amazon. In which the displayed at the visitors of the site should direct them to the products site, and they tend to make a purchase then lead them Amazon to buy the products. The company should be ready to dispatch the product at the Amazon or variable warehouses that are highly needed to participate in Amazon Choice Badge. The customers will not wait for a long time to get the product hence; the company should focus on shipping timings. The real-time customer reviews are the main aspects in getting the higher Amazon’s Alexa SEO ranking. As the product has the number of positive reviews, the more will be the chances to picked by the Amazon’s Alexa. There are certain essentials should be altered by the companies to reveal their product that gives better SEO results of Amazon’s Alexa. While coming to particular product, everything should be handled carefully that shows an impact on the purchasing activity of the consumers. Make concentration on while assigning the title to the specific product that surely clutches the attention of the customers. The use of size, brand, model and color are the preferable keys to roll at the eye of the customers at the Amazon. The idea of providing the fine quality images that give the most efficient results while the customer zoom-in that product is the better way to reach the Amazon’s Alexa. The good user experience will help to build the stronger customer relationships that make, the higher conversion to rank higher in Alexa. There are many keywords that are swapping the trading system of the brands on the website. Try to generate the most seeking and trending keywords that are completely relevant to that product. Most of the customers are preferring filters in the Amazon to get the most searching experience that displays the appropriate products. It saves the time and the use of internet data. Providing the customer intended data will helps to get the Amazon choice badge. The branding your product through the description will let the customers know about your products that what is meant for and to what extent it can fill the customer needs. Get in touch with the program of Amazon sponsored products which will display the product ads of the particular brand at the right side or bottom of the Amazon’s page where the huge number of customers are looking into the products. It is the better way to get more sales as well as to strike at the Amazon’s Alexa. 50% of web searches will turn to voice search in 2020. Voice service digital assistances are being used by the 18.5% of US people per month. Voice takes over the traditional search, i.e., is 20% voice search has made only through mobile. There will be 21.4 million voice assistant speakers by 2020 in the US. The voice search market will be the industry of $601 million. The voice search assistant is being used by the 40% of adults. The 1 out of 5 web searches has occurred through voice search especially on Android app in the US. The giant brand ambassador of digital speakers Amazon has sold smart speakers of 5.1 million. Only in the starting 9 months of 2016 Amazon has sold 2 million smart speakers. 500% of Alexa application improvement in the next six months of 2016. In the last 5 months, 49% growth has occurred due to the household usage of digital assistants. The Amazon and Google count to have the usage of 94% of smart speakers. The voice search is the coming and ongoing trends that revolutionize entire marketing industry in making the promotions of the particular products or services. Amazon is the origin of setting the digital trend just as the voice search has become a key aspect for the brands to expose themselves at the customers.